I’m throwing it back to the recently completed Solana Surf Lofts project to show you a major transformation of the exterior. I was so excited to not only get to totally flip the inside of this building and each unit, but also get to play a role in the exterior facelift. Being steps away from the beach and Fletcher’s Cove in Solana Beach, we knew we wanted this building to play into a more modern, Cali-cool vibe. WHAT’S COOKIN’ GOOD LOOKIN’! We updated the bland beige with a full blown white-out, and painted the brown headers, trim, and windows black for a modern twist and stark contrast from the white. I knew I wanted to bring a pop of color into the doors without being so in your face, so we landed on this muted sky-blue, which we tied into the exterior mural. The exterior mural of my dreams! I got to team up with my very talented other half, Attila Betyar, to bring this building to life. Attila is a wizard of painting waves, whether it be on buildings, canvas, or shoes (also the artist and brains behind The Canvas Way) - we knew he was the guy for the job. He hand-painted both the text and wave element over the course of two days and tied in our front door color + black into this simplistic but powerful piece. If you’re ever in the area, this beauty is located just behind the Pizza Port and is a must to see in person. Solstice Interiors on DESIGN MILK! Leo is on DESIGN MILK! Oh boy, was this year a good one!!! Thank you to each and every one the wonderful clients, vendors, and tradespeople I got to work with this year. Reflecting on the projects of the year I am truly blown away by not only the amount of love and positive feedback I’ve received from these projects, but also the growth personally and professionally I’ve experience with each one. Here’s to an amazing year, and an even better year on the way. Blogging on a Saturday, who am I?! Someone very inspired by this lovely fall season, obviously. Give me all the cozy, chunky-knit blankets and rust-colored textiles. While I am a Cali girl through and through - which evidently leads to me knowing nothing about seasons - there is a true shift and refreshing vibe about fall. I love seeing fall-influenced palettes and being inspired to jump out of my own neutral-comfort zone a bit, even if it’s just through temporary accents and textiles. Here’s a glimpse into my own little slice of fall heaven - enjoy! While I know this is WAY overdue, I figured better late than never right? Prepare yourselves - the before of the beautiful House of Whiskey project can be frightening, but I’m sure as you’ve seen it’s far from that now. I had the pleasure of working with a good friend on this project and was able to take his vision and create a modern, surf-shack inspired home nestled in the heart of Bird Rock, San Diego. We completely gutted this residence, just leaving the overall wall footprint the same. We renovated the flooring throughout, both bathrooms, the kitchen, and gave the exterior a major face-lift. I hope you enjoy seeing this transformation as much as I enjoyed designing it! This kitchen was a wood and granite overload, and had seen its day. 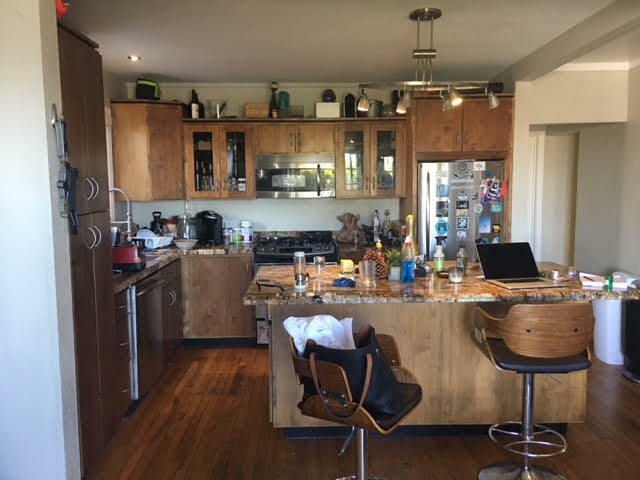 We ripped everything out of there and went with a simple, timeless white-shaker cabinet and some square-edge black hardware to modernize the space. This paired with the natural wood floating shelves added some warmth and variation to an all-white kitchen. More wood and granite, paired with a pink tiled shower…. but why!! I was SO excited to demo this bathroom. I had an olive-green bath vanity in mind for quite some time and knew this was the perfect opportunity. I got real funky with the mix of materials - a patterned floor tile, a muted-grey penny tile in the shower floor, and white subway tiled flipped vertically. I wanted to spice things up while maintaining a monochromatic palette, so that the olive green vanity was the major pop of color and wasn’t competing with anything else. Wood and granite, we meet again. ICK! There was a door that led to this bathroom from the entry stairway, and two large windows that were rather low if you imagine any guest coming over and you’re in that bathroom… hello! Behind the sink were more windows that spanned from the countertop, up to these weird funky uppers that were unusable and made the already small master bath feel smaller. So, we took out those weird upper cabinets, dry-walled behind the sink, removed the door and put in two new, smaller windows. We added a second sink, and a wall-to-wall frameless mirror to make the space feel larger. The palette was meant to be like a breath of fresh air, light, bright, and clean. The final cherry on top was the exterior of this project. This space was previously an old, faded grey with some brwn-purple trim. It had to go. We went with a matte black horizontal siding throughout, and an Ipe-wood accent wall with La Cantina’s to totally open the space to the giant outdoor deck. See more of the House of Whiskey project featured on Domino Mag! All photos (aside from the glorious before photos) were taken by Stacy Keck. 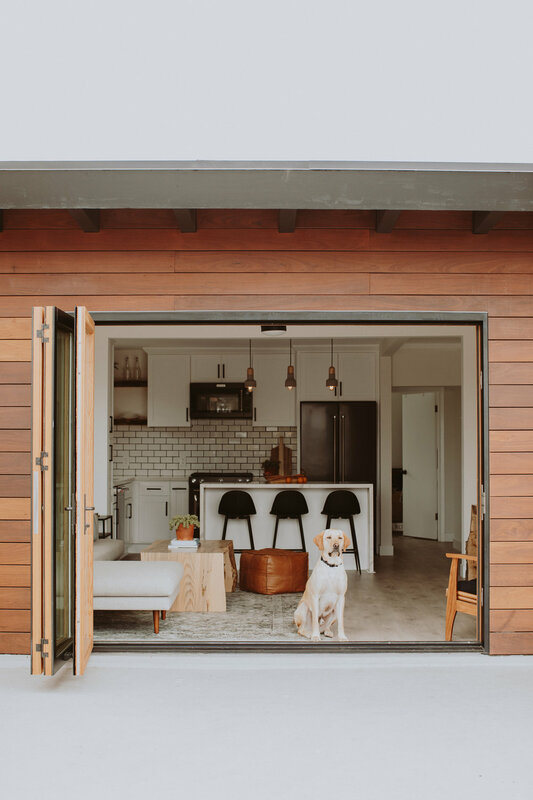 While Pinterest is always a good go-to source for inspiration, or a walk around my little beach town of Leucadia, I definitely have those designers I always go to for inspiration. It's amazing to see what makes a designer successful, read their blogs on what to do/ what not to do, and learn from the best! Today on the blog I'll be rounding up a couple of my all-time favorite designers currently. I was in Portland last year visiting family, and came across this absolutely stunning hotel lobby and bar - the Hi-Lo Hotel. I think my jaw actually dropped to the floor. Blush, emerald greens, and brass can be so trendy but they found a way to bring that trend into a timeless, dreamy space that you do not want to leave. I mean, do I really need to even say why I love Amber Interiors?! This 'Client Black Houses are the Best Houses' left me drooling. Amber Interiors has created her own notifiable aesthetic, yet still is able to evolve and level up her designs to keep things unique. 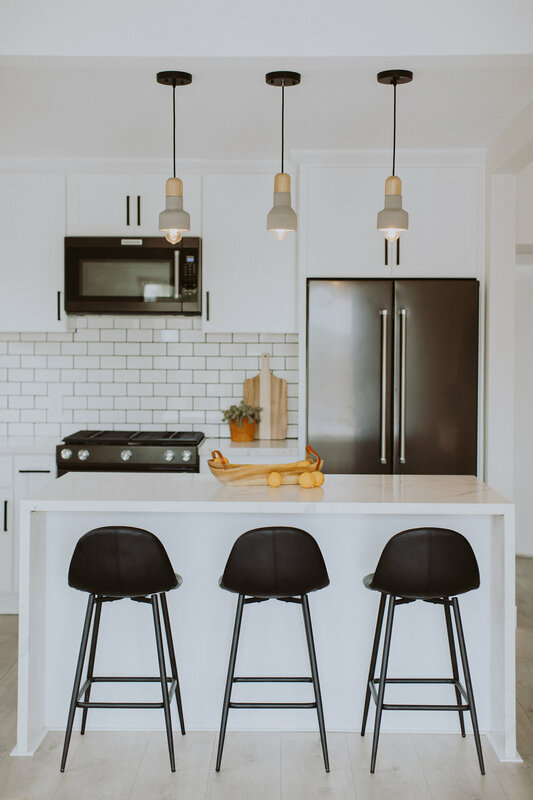 This space was the perfect blend of that California-cool-meets-boho with a new, modern and minimal twist. I always look forward to seeing what she comes up with next! Oh boy do I love this lady!! I swear I'm not totally biased because I get to call Vanessa of Studio Matsalla one of my mentors and friends ;) Studio Matsalla was the first designer in San Diego that really stood out to me years ago when I moved back home from school in LA. While you can see boho and mid-century influences in her designs, I love seeing her unique twist on projects. Not one detail is overlooked, and every project just seems like a perfect complete little puzzle. Vanessa's designs are timeless, soothing, bright, and I basically want to live in every space she creates. This built-in dining situation from heaven is what first caught my eye from JDP Interiors. Her aesthetic is something I strive for - modern, clean-lines, with warmth through natural materials and hues in textiles. Designs are all natural and bright, mixed with unique and eclectic details.